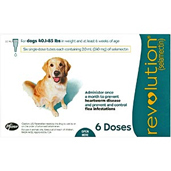 Shop for pet medications to treat ear mites in dogs and cats at VetDepot.com. The most common type of mite to infest the ears of cats and dogs is Otodectes cynotis, an eight-legged parasite no larger than the head of a pin. Ear mites feed on oil and wax inside the ears and live for about three weeks. During their life cycle, the mites can cause significant inflammation and irritation in the ears and increase the risk of ear and skin infections. "Once an ear mite infestation occurs, you must isolate your pet to protect other animals in the household until the infection is eliminated." Symptoms of ear mites in pets typically include a dark, coffee ground-like discharge, scratching and rubbing of the ears, a foul odor emanating from the ear canal, head shaking, hair loss, and visible skin irritation in or near the ear. In severe cases, the ear canal may become obstructed with the dark, waxy discharge, or excessive scratching may cause blood vessels located inside the ear to rupture (aural hematomas), a condition that requires surgical repair. Once your veterinarian makes a diagnosis based on your pet's symptoms and a sample of the ear discharge, he can design a treatment plan for the type of mites infesting your pet's ears and the severity of your pet's symptoms. In most cases, prescription ear drops are required to kill the mites responsible for your pet's symptoms. Antibiotics may be necessary if a secondary skin infection is present, and topical medications may be used to treat skin inflammation and irritation. Treatment must continue for as long as prescribed to prevent a recurrence. It is common for symptoms to improve before the mites are fully eliminated. Infected ears and those with an excess of waxy discharge will require frequent cleaning with an ear cleanser and cotton balls. 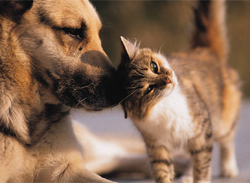 Your veterinarian will give you instructions about how to care for your pet's ear during and after therapy. Ear mite infestations are not always preventable because they are highly contagious and commonly occur on a variety of animals, including cats, dogs, rabbits, and ferrets. However, routine cleaning of your pet's ears enables early detection and treatment of problems, which in turn reduces the severity of symptoms and the risk of complications. Moreover, regularly removing wax and oil from your pet's ears during cleaning makes the environment less hospitable to mites and helps prevent infection. 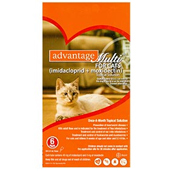 Products such as Revolution and Advantage Multi can help protect your pet from ear mites when used as directed. Once an infestation occurs, you must isolate your pet to protect other animals in the household until the infection is eliminated. Also, wash your cat or dog's bedding and toys regularly in hot water to kill any mites and prevent a recurrence. Some veterinarians choose to treat all other pets in the household, even if no symptoms of mites are present yet.